Video-sharing service YouTube has wiped nearly 30,000 files from its website after Japanese media companies said their copyright was being infringed. YouTube was recently bought by search giant Google for $1.65bn (£883m). Critics of the deal have warned that Google could face a barrage of lawsuits over copyrighted material on YouTube. 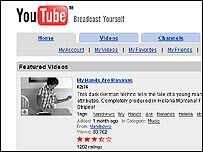 Launched in February 2005, YouTube shows about 100 million clips per day. YouTube mostly hosts homemade videos, but it also contains clips of copyrighted material. A spokesman for the Japanese group said it was considering asking YouTube to introduce a preliminary screening process to stop illegal video files being placed on the site. YouTube has recently signed distribution deals with media groups including Universal Music Group, Warner Music and CBS to offer short-form programming including news, music videos, sport and entertainment.